Bard StatLock Foley Stabilization Device features a patented swivel retainer that maximizes comfort while providing an enhanced sense of security. 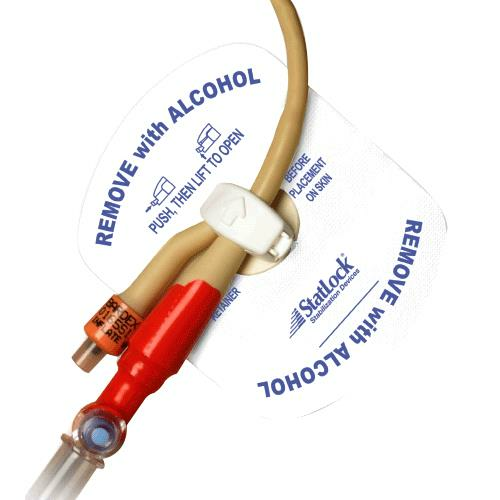 It stabilizes the catheter to prevent pistoning and accidental dislodgement, while the swivel design allows catheter movement with the patient without exerting a pull force on the catheter. 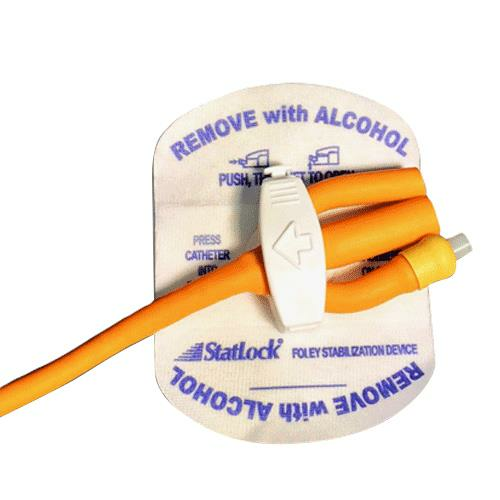 StatLock is available in both adult and pediatric sizes and works well with most latex and silicone catheters. It provides lock tight securement, releasable whenever required. How to maintain your StatLock Foley Stabilization Device? How To Apply StatLock Stabilization Device? Place Foley catheter into retainer. Directional arrow should point towards catheter tip, and the balloon inflation arm should be next to the clamp hinge. Close lid by placing your fingers under the pad and pressing the grip markers at the end of the clamp with your thumb, being careful to avoid pinching the catheter. Identify proper securement site by gently laying the StatLock Stabilization Device straight on the front of the thigh, then back up one inch towards the insertion site. * Make sure leg is fully extended. – Gently place the StatLock Stabilization Device off to the side, away from the selected securement site. Cleanse and degrease securement site with alcohol, or per hospital policy and procedure. Let skin dry. Be sure to clean area larger than securement site. Apply skin protectant using both pads, in direction of hair growth, to area larger than securement site. Allow to dry completely (10-15 seconds). Using permanent marker, write initials and date of application on StatLock device anchor pad. Align the StatLock Stabilization Device over securement site leaving one inch of catheter slack between insertion site and the StatLock device retainer. * Make sure leg is fully extended. While holding the retainer to keep the pad in place, peel away paper backing, one side at a time, and place tension-free on skin. How To Remove StatLock Stabilization Device? 2. Remove Foley catheter. 3. Wipe the edge of the pad using at least 5-6 alcohol pads until a corner lifts. Then continue to stroke undersurface of pad in a back-and-forth motion by squeezing the alcohol out to dissolve the adhesive pad away from the skin. The device must be changed at-least once every 7 days and should be assessed every day. If stabilizer pad becomes soiled, wash with soap and water, saline or hydrogen peroxide. Remember not to use alcohol or prepackaged bathing systems as they can lead to early lifting. If showering or bathing, cover the StatLock stabilizing device with plastic wrap or waterproof dressing. Conduct skin assessment prior to application and repeat daily per facility protocol. Use clinical judgment on the removal of the device if the patient experiences any fluid shifts that may interfere with skin integrity. Known tape or adhesive allergies. Do not re-sterilize the device as the sterility of the device is not guaranteed following re-sterilization.